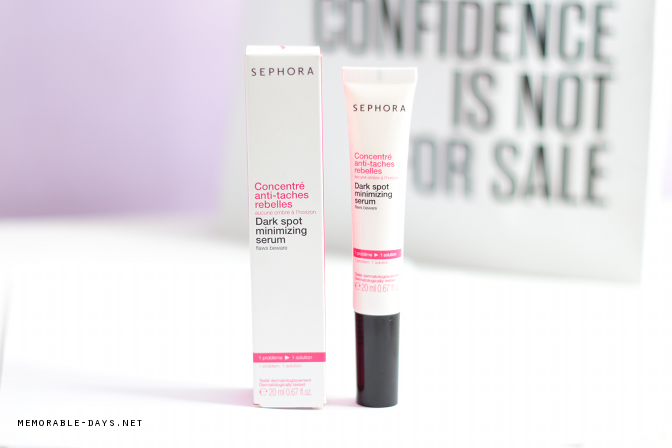 Review: Sephora Dark Spot Minimizing Serum | Memorable Days : Beauty Blog - Korean Beauty, European, American Product Reviews. I've always been hunting for products that will lighten my scars (created by pimples) and my freckles. 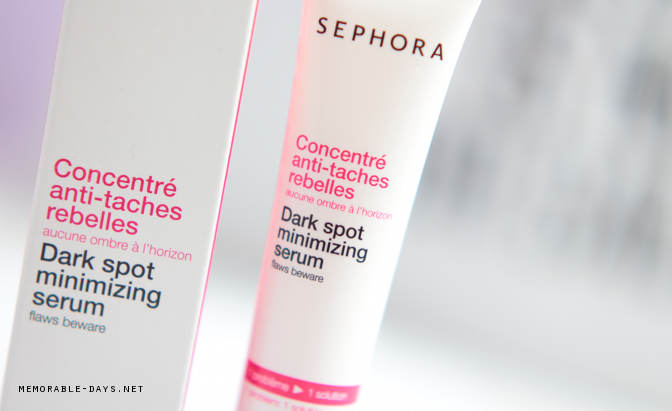 I've been testing the Sephora dark spot minimizing serum for 2 months and in this blogpost i'm going to share my thoughts about it. Do you know any products that will lighten freckles and remove pimple scars, let me know in the comment section below, it will be much appreciated ^^. This serum claims to reduce the appearance of dark spots and other minor skin imperfections, while its ultratargeted micro-exfoliating applicator helps the penetration of ingredients to boost the efficacy. It's a serum that doesn't contain parabens. Research results: In a one-month scientific test of 22 volunteers: dark spots were three times less visible, 72% of dark spots were reduced, skintone was evened out by 33%. Lets see if this works on my skin as well. It's sold for $20.- on the Sephora website (link to product), i think i bought it for €14.- at the Sephora store in Spain. The packaging is quite clean - it's white with black and pink words. The description is written in English and French. According to the description it should be suitable for all skintypes, even the sensitive ones. I doubt that though since this product does contain alcohol, i don't think it would be suitable for everybody. On the packaging it's explained how to use the serum. 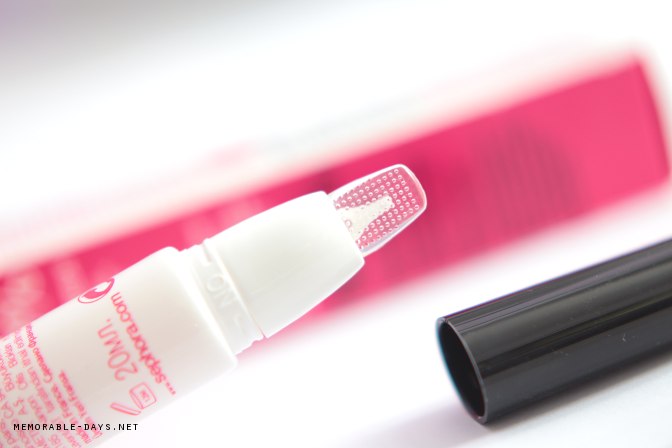 You just need to twist the opening and squeeze the tube to get the product out. A little goes a long way, so one tube will last you for 3 months at least. 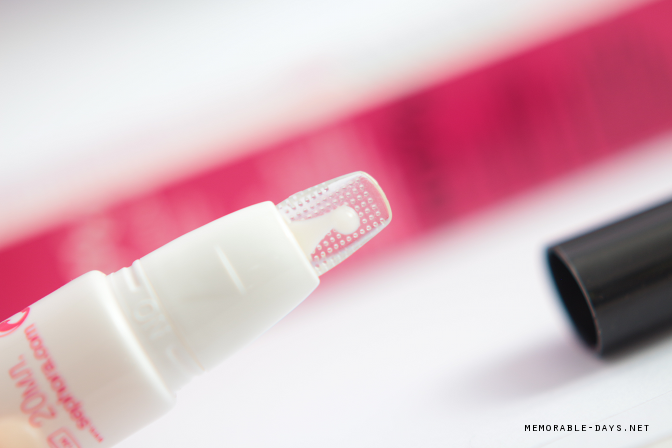 On the other side of the applicator you can find a micro-exfoliating applicator which will help to reduce the appearance of dark spots. 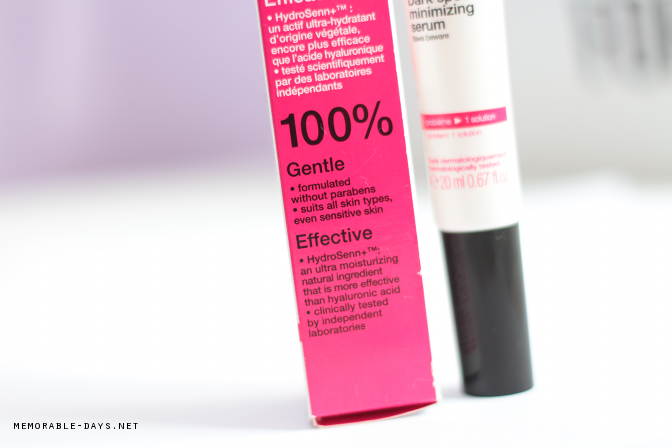 The serum is lightweight and it dries in a few minutes. This serum does have a fragrance, it has a fresh floral scent to it which is not overwhelming. It's a pleasant scent. To see results, always use a high-protection sunscreen (SPF 50). Morning and evening, apply locally on dark spots (face, neck area, hands), and then massage a few seconds with the exfoliating tip of the applicator. • Licorice Extract: Acts on pigment disorders and the process leading to pigmentation disorders in the skin including the appearance of dark spots. • Hop Extract: Speeds up the skin’s regeneration process. 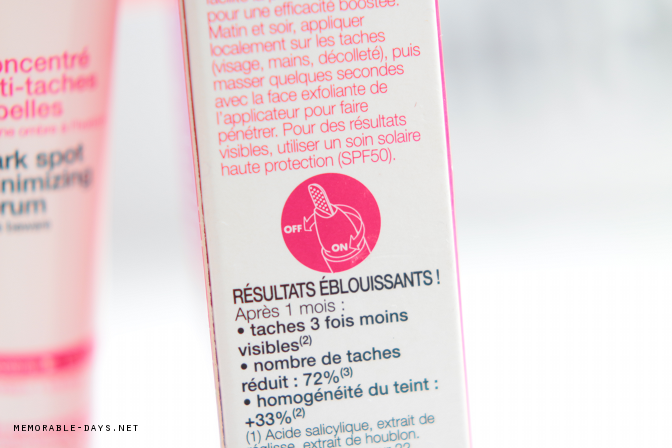 • Salicylic Acid: Exfoliates to act on skin irregularities and support cellular renewal. • HydroSenn: Intensely moisturizes even more effectively than hyaluronic acid.